edjing is a powerful DJ mixer console studio available for your Windows 8 and 8.1 desktop. 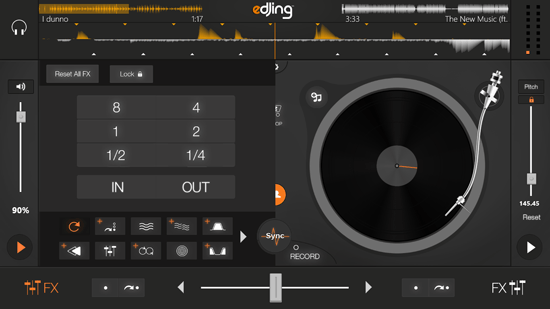 If you love mixing songs or even just playing around with the music you have then this DJ mixer app is rightly for you. The features of edjing make it stand out of the other music mixing apps and software. This is a free version of edjing, but you can upgrade the app to avail some of the locked features and access the whole app without any interruptions. The features of edjing include adding songs from your computer drive, adding effects to the song, scratching and mixing songs, auto mixing songs, change pitch of the song, record the songs, etc. You can add the song to each deck by clicking on it and loading the music from the library on your computer. The song added can have different music effects applied to it such as loop, echo, flanger, cue, beatshuffler, etc. You can save the mixed songs using the record button on the middle of the edjing screen. The recorded music file can also be shared with your friends on Twitter or Facebook. There is no limit on adding music to edjing from your local library to it. In addition to the above working areas of the app, you can let the app automix the added tracks by choosing and applying automatic transitions to the playlist. 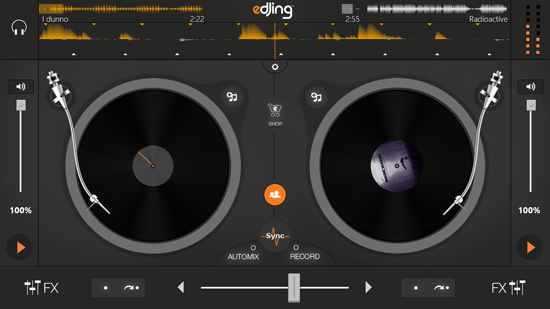 This DJ mixer app is beautiful and has really impressive user-interface with great graphics. One of the best things about the user-interface of edjing is that it is intuitive. The smooth yet crisp layout of the app makes it easier to use it. All the buttons, options and tabs are very well organized on the app. Mix infinite number of songs on your Windows 8 and 8.1 desktop with this amazing DJ mixer console studio.